When most people hear the words African wildlife conservation, they are most likely to think of rhinos, elephants and lions. This is mainly because the conservation conversations in the last few years have revolved around the appetite for wildlife products in Asia and the poverty that originally drove poachers to kill these species for gain. Little is said of Painted Wolves (African wild dogs), even though there are fewer of them. It is time Painted Wolves had a seat at the conservation table. Why are their numbers so low? For the last 100 years, the painted wolf has endured an outrageous onslaught, which has seen their numbers decrease from 500,000 a century ago to only 6,500 today. This 99% reduction in their population has put the wolf ’s survival on a knife edge. Painted Wolves are also impacted by human poverty. While other predators are their biggest threat in the wild, snares meant for buck, and diseases carried by unvaccinated domestic dogs from rural communities are constant problems. Road kill deaths are also on the rise. There is not much to be done about other predators, these are ancient rivalries, but there is a lot we can do about snaring, diseases and awareness on the road. Painted Wolves: A Wild Dog’s Life is told with insight and passion from two people who know them well, each with their own unique perspective on this endearing animal. This story is told in three parts. In the first section of the book we are introduced to the painted wolf and learn not only about the fascinating features that make them so special, but also the history of their persecution and the challenges that they continue to face today. In the second part, Nick takes us deep into the wild Zambezi Valley where he has been following and photographing painted wolves on foot for the last six years. Here you will meet the incredible alpha females Tait, Blacktip and Tammy, as they live their lives away from the destructive influences of man. You will experience them at the den, on the hunt, feasting and through the ups and downs of family life. In the third section, Peter provides a real insight into conserving the painted wolves based on twenty years dedicated to their survival. Although they are now a protected species, they still face a relentless assault from snaring, roadkills and disease. Peter takes you into the tough world of conservation, describing the many challenges and the innovative and successful solutions he has introduced. The book is illustrated with more than 220 stunning images. Each photograph tells a story in its own right and brings alive the captivating and mysterious world of the painted wolves and the lives of those around them. The limited print run of this collectable masterpiece will be printed on 200gsm silk paper by a leading Dutch printer. All profits from the book go to the Painted Wolf Foundation. How do you get your paws on this treasure? September 4 saw the launch of the Kickstarter campaign to crowdfund the final publishing costs of the limited print run book. The campaign ends on 7 October. At this point, this is the only way you can get a copy of the book. The book will be launched in October 2018 with launch venues and signings in San Francisco, New York, London, Amsterdam, Perth, Johannesburg and Harare. Our wines will be a feature at some of these events. The launch will coincide with a new BBC series presented by Sir David Attenborough: Dynasty. 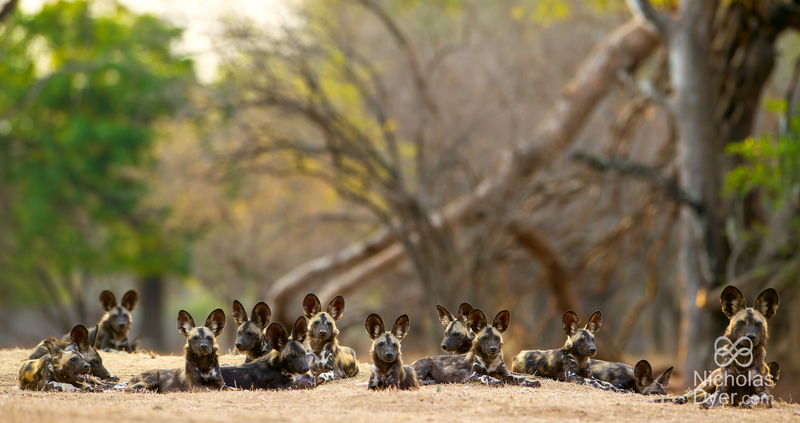 One of the episodes features the Painted Wolves of the Great Zambezi Valley in Zimbabwe. Nick grew up in Kenya and always had a passion for photography. After careers in finance and marketing, stuck behind a desk in London, he took the decision to return to Africa and turn his life around to dedicate it to photography, writing and wildlife conservation. He discovered the painted wolves of Mana Pools National Park and fell in love with them. Nick has spent much of the last six years living in a tent while following and photographing three packs on foot. Peter fell in love with painted wolves while watching documentaries in his native England. He volunteered for Painted Dog Conservation (PDC) from home in England for two years and then initially moved to Zimbabwe as an unpaid six-month volunteer. He has now been there for 20 years and serves as Managing Director. Peter has helped translate the initial vision for PDC into effective programmes that have made a significant difference to the survival of the species. Fall in love with Painted wolves like we have.